It's a big win for Italian's vermouths this year. The go-to brand in our poll of bars is Bacardí’s Martini, with 27% saying it was their most used. Around half of bars stock the brand, which had looked a little tired (perhaps resulting in its fourth-place finish last year), but the launch of Riserva Speciale has added a premium dimension. Bartenders have started to pick up on the new line, which is prized for providing quality at a good price. 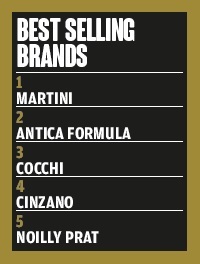 Antica Formula, which was last year’s top brand, was the top vermouth in 12% of bars and a top-three fixture in 41%. 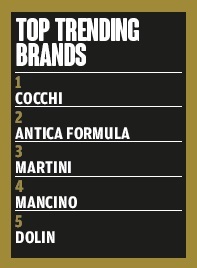 Cocchi is a close third – it’s the top vermouth in 12% of bars and a top-three serve in 41% again. Both these brands are bartender favourites, albeit mostly not as house vermouths. Gruppo Campari’s Cinzano was a top-three brand in a quarter of bars, a share percentage the French Noilly Prat was just a little short of.